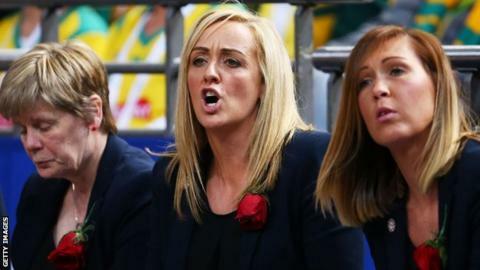 Tracey Neville has been named England head coach on a permanent basis. The 38-year-old former international was named as interim coach following Anna Mayes' dismissal in March. Neville led England to a bronze medal at the Netball World Cup in August, despite the death of her father, Neville, on the opening day of the tournament in Sydney. "I am extremely proud to have been appointed as the England head coach on a full-time basis," she said. "The focus is now for England to become the best in the world and I am passionate that we reach this goal." Neville, the sister of former England footballers Gary and Phil, previously coached Superleague side Manchester Thunder and helped them win the domestic title in 2014. Under her leadership at the World Cup, England won six of their eight games, and beat Jamaica to the bronze medal. The Roses return to action in January, when they host a three-match international series against world and commonwealth champions Australia.